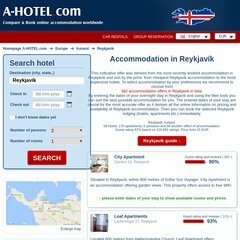 Topics: World, Europe, Iceland, Proceed To Content, Reykjavík Accommodation, and Reykjavík Weather. There are 2 Nameservers, ns2.ignum.cz, and ns.iinfo.cz. It is hosted by Internet Info S.r.o. Praha, using Apache/2 web server. Nette Framework is its coding language environment. A time of 116 ms, is recorded in a ping test.